Smeg Refrigerator Reviews - High Quality Retro Refrigerator! SMEG are the Italian company that specialise in kitchen appliances for your home. They have a long history and have been operating since 1948, producing cookers, ovens and dishwashers for your home. In this SMEG Refrigerator reviews guide you will learn all about SMEG as a company, their history, the products they produce, and their quality. SMEG have a vast experience working with metals and it’s from there that their expertise comes. Believing in producing some of the most useful, but stylish products is at the heart of what they do. They’ve now expanded and make kitchen sink fittings and other accessories. 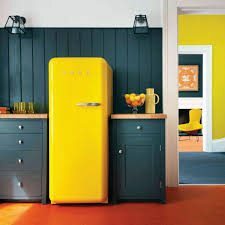 In the 1950s they produced the iconic SMEG refrigerator. This retro fridge was an instant hit and became insanely popular worldwide. Still popular today for it’s style it’s present in establishments and homes internationally. The SMEG refrigerator is still one of the most popular fridges on the market. Let’s take a closer look at what makes it so sought after. SMEG have a wide range of different refrigerators for the home. When browsing their products you’ll see all the modern options, including the popular stainless steel fridges. Some of SMEG’s most popular products are their retro range. Inspired by the fashion of the 50s these fridges are now iconic, with curved edges and a more basic feel they are known around the world. 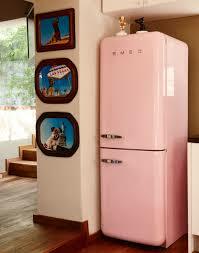 SMEG also produce specialist art fridges. These include unique mosaic designs and transform a kitchen appliance into something much more, a centrepiece for your kitchen, and is a great way to renovate your kitchen! ● Color - Choose from classic black or white, to pink or pastel green. ● Size - Available in a range of sizes to fit your available space. ● Proportions - Different models allow for different fridge/ freezer ratio to fit your needs. ● Doors - Customise your handles and choose from a right opening or left opening door. ● Artwork - Custom artwork can be applied to certain fridges. 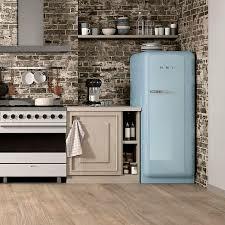 SMEG fridges may be retro but they come with the modern fittings. They’re energy efficient and have all the features you’d expect from a modern fridge, making them stylish and useful. SMEG have set themselves apart in their range of designs. They offer more creative style in refrigerator than any other brands whether you’re after a modern fridge or a classic old school design, they’ve got you covered. SMEG show that they know the importance of a refrigerator to your home. They want it to do more than just operate, they want it to add something and stand out. The style options combined with the customisable features make them useful to any home. 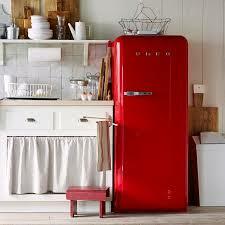 SMEG are one of the best known brands around for fridges, specifically for their retro design. With a long history in the industry they’ve applied their expertise to making units which are useful and good looking. SMEG have dedicated laboratories to experimenting with different materials to use in their products. This lets them constantly improve upon their ranges and do more with less in the home. While SMEG is one of the best known for their designs they don’t appear to be as reliable on the interiors. There seem to be some issues reported by customers that there are some quality issues with the products and that they don’t function as well as they should. This is worrying from a refrigerator company for sure, and while they do have unique styles and design options you don’t see elsewhere, you still need to be careful about the product as it isn’t cheap. On paper SMEG have the expertise to make some of the best fridges around but there do seem to be some issues. “The SMEG not only looks great, it works great. I purchased mine about 4 years ago after seeing it in a boutique store downtown. I really loved the color theme and the 1950's retro style. Overall I am happy with my purchase!” - Lisa S.
While we found quite a few positive reviews for the SMEG fridge, there is also a few negative reviews. These complaints mainly talked about some issues involving the construction quality of the interior hinges on the fridge. I personally haven't run into this problem, but I have seen a handful of reviews that mention this, so it is something you should be aware of. SMEG have a lot of things going for them as they have unique designs which are known worldwide. You can’t really get the same style choices anywhere else so if you want something standout you pretty much have to go for them. The personalisation options are great too. Being able to select from a wide range of colours and add different door hinges and handles is great, letting you use every inch of space available. The downside of SMEG is the internal quality. They seem to have spent too long on the aesthetics and not done enough to make the machines functional. These issues with quality are alarming and considering that the units aren’t cheap it’s enough to make us think twice. If you have your heart set on a SMEG refrigerator then make sure you check the warranty information and the process for if something does go wrong, It’s always best to be prepared. On paper SMEG fridges seem great, and they are if you only pertain to the aesthetic look of the fridges, but some of the interior pieces might be a little subject. That being said, if you are interested in purchasing a SMEG then check out the warranty info and test your product while you can. If you are in need of some kitchen cabinets to match your new refrigerator I suggest you take a look at our cabinet reviews!